Claire Shepherd is a native South African, who originally set-up Zuza Trading with a festive theme, however the product range is now continually expanding to include general homeware and other lovely things. Claire moved from South Africa to Edinburgh in 1999 to undertake an MBA in International Business studies. Following various holidays visiting the Lake District Claire fell in love with the area and moved to Cumbria in 2010 to run a guesthouse overlooking the idyllic Bassenthwaite Lake. Traditionally the tourist season dips over the winter months, which gave Claire the opportunity to reconnect with her homeland and to work with a community of crafters in the Kwazulu Natal region as part of an income generation project to develop Zuza Trading, bringing a flavour of South Africa to Europe. Zuza Trading regularly attends various craft and events in and around Cumbria, so take a look at our Events page to see where you might find us next. If you're in the Lake District and you'd like to visit us, please just call to let us know that you're coming and we'd be happy to welcome you to view our stock. During 2017 a partnership between West House and Zuza Trading was set up. West House is a charity based in West Cumbria which supports adults with learning difficulties. Zuza Trading is delighted to provide opportunities to clients from West House to enable them to become "employment ready"
Sean Burke and Kane Towers are working at Zuza Trading's Maryport offices ensuring that our products are checked, tagged, barcoded and packed for delivery to our customers based across the UK and Europe. 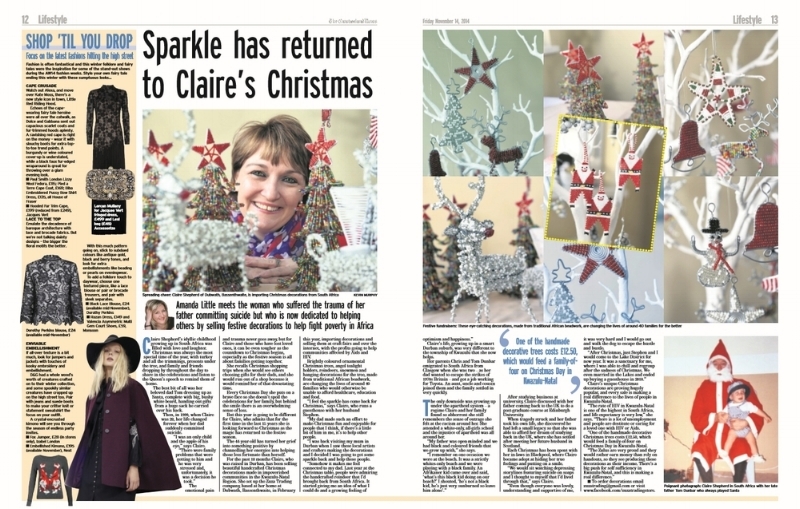 In an article written by Amanda Little from the Cumberland News (14 November 2014) Claire explains how the trauma of her father committing suicide helped her to start a business dedicated to helping others by selling festive decorations to help fight poverty in Africa.